Cows Love Watermelon and Pumpkin! Did you know that cows love watermelon and pumpkin? Ours sure do! And, we love FREE food for them! It is rare that we have a watermelon from the garden go bad. In fact, I’m not sure we have ever had one rot! Once we have eaten the red, the cows get the rind and love it. But, boy, do they love the red! 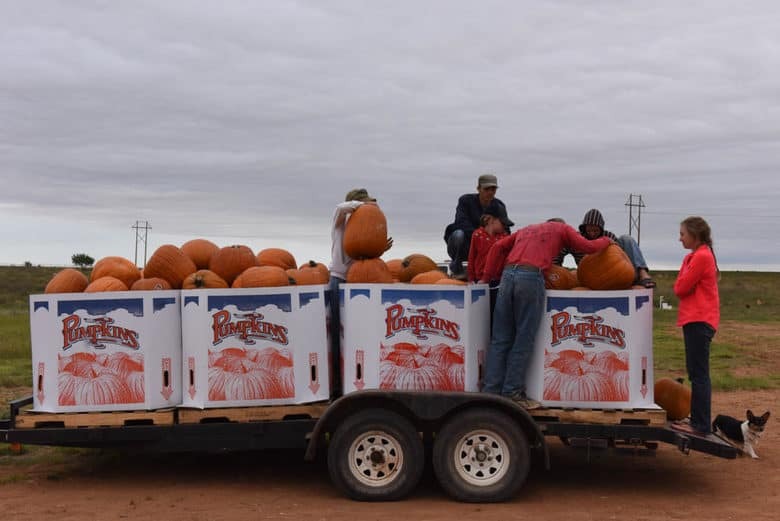 Not too far away from us is a watermelon and pumpkin packing plant owned by a local farmer. He grows, packs and sells watermelon and pumpkin to grocery stores, Sam’s and Wal-Marts. With all the rain we have had this growing season, they have had quite a few go bad. Unfortunately, once the big boxes are packed, if a watermelon or pumpkin goes bad in it, they will all spoil very quickly. 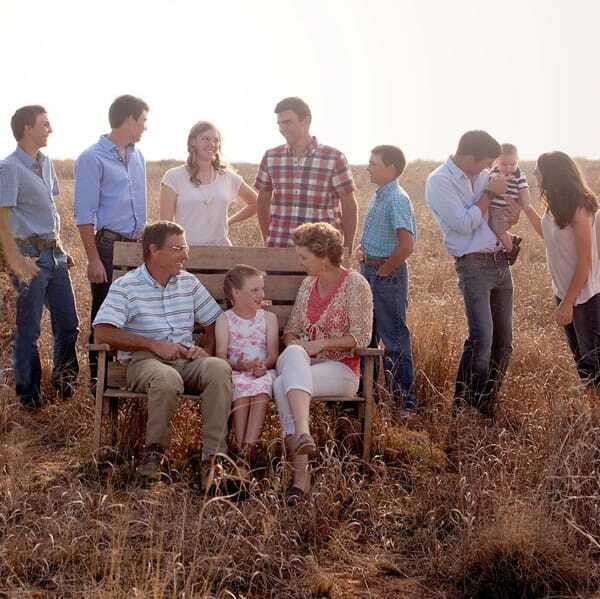 That’s where we come in – we help them get rid of the packed boxes that are spoiling – FREE! 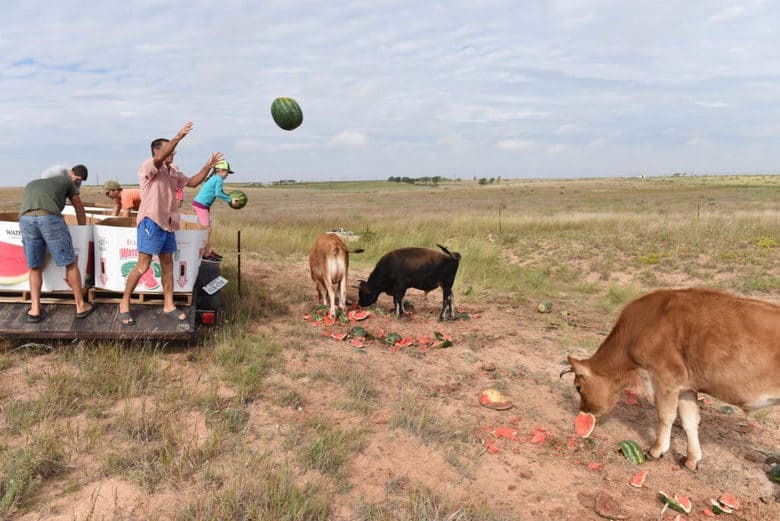 It may be hard to picture a family throwing watermelons to cows, so, let me help you – it really is fun! The cows get so excited, they hop around not being sure which one to attack first! It is quite a site! Beatrice that you see below is probably the calmest of the bunch and does a good job of getting out the red before moving on to the next one. Once they go through all that we have thrown eating the red, they will go back and eat the rind. Sometimes it is later in the day but, they do eat it all! It is easy to tell when they are done because they ask for more by standing at the fence mooooing! 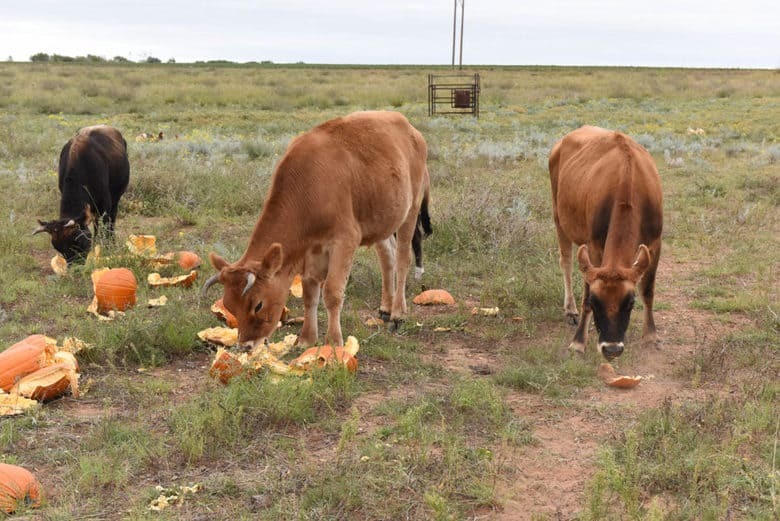 I did not realize how much cows love watermelon and pumpkin and it was sad when there were no more watermelons for them – it took a couple of days before they stopped standing at the feeding spot mooooing! Then came pumpkins! As you can see below, we have helped the farmer get rid of pumpkins too! These are from a truck headed to Sam’s Club that was returned because a few of the ones on top had mold on the stems. Again, a result of all the rain we have had. The mold is actually the same type that showed itself as bunch rot in our Roussanne grapes this year. Most of these pumpkins are still very good and we have pulled out a lot to use ourselves. I can’t wait to make Pumpkin Spice Gingerbread Cookies, Pumpkin Pie Pudding, Pumpkin Soup, Pumpkin Pie, Pumpkin Bread and, of course toasting the seeds! 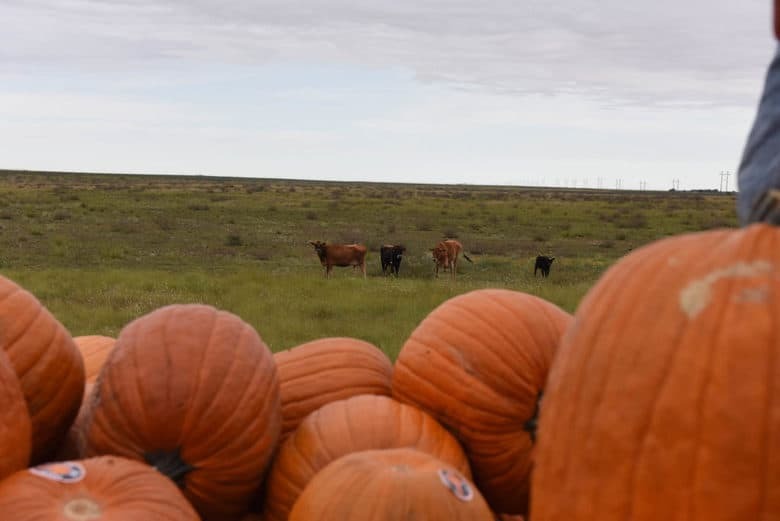 As soon as they saw the trailer filled with pumpkins pull up, the cows headed our way! They knew we had something for them! Everyone threw at least one pumpkin before pulling the trailer further down to where we normally feed them. We have kept the watermelons and pumpkins further away to minimize the flies and fruit flies around the house. 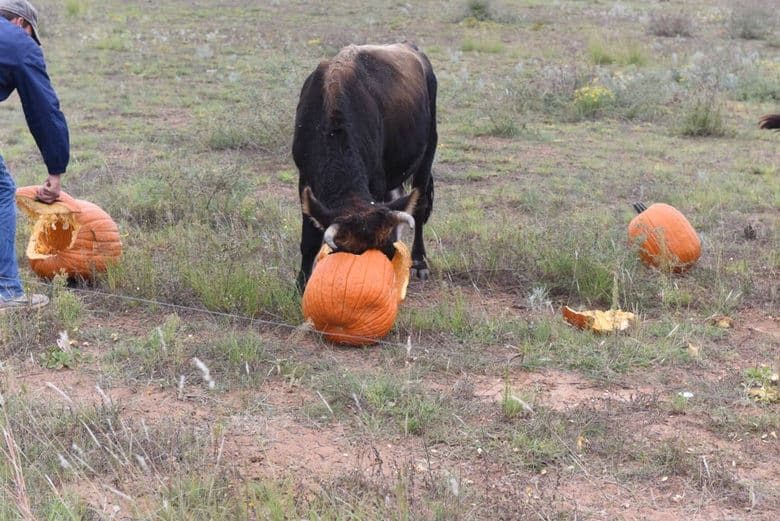 But each cow found a pumpkin to buy their head in! It is amazing how well they clean the inside of the pumpkin eating the meat and leaving the shell. But, yes, they do eat the shells too! I want to help you visualize just how funny it looks to see a cow’s head buried in a pumpkin – all you see are his horns! 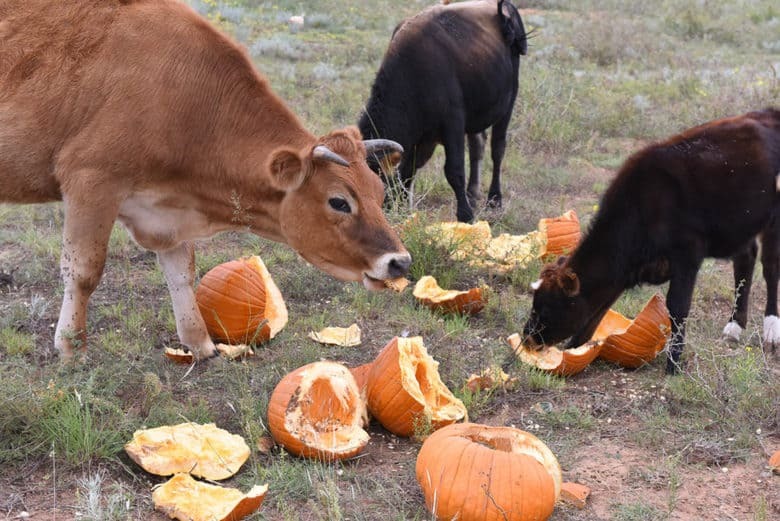 Well, this load of pumpkins will last for quite a few days and hopefully, there will be more to come because these cows love watermelon and pumpkin! Do you have any funny animal stories? Leave a comment – we’d love to hear them! 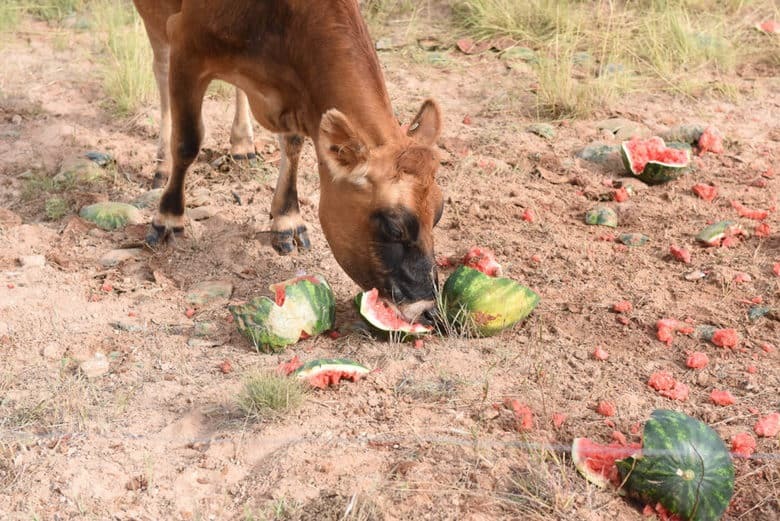 Thanks for posting, I wasn’t sure if could feed the watermelon with seeds to the cows? Rodney, ours love them – seeds and all! We lived your story and ate going to try pumpkins. Ours love watermelins. Since we live in Florida we get truckloads of the second watermelons and throw it to them. They love the watermelons. Loida, I am so glad you enjoyed it. 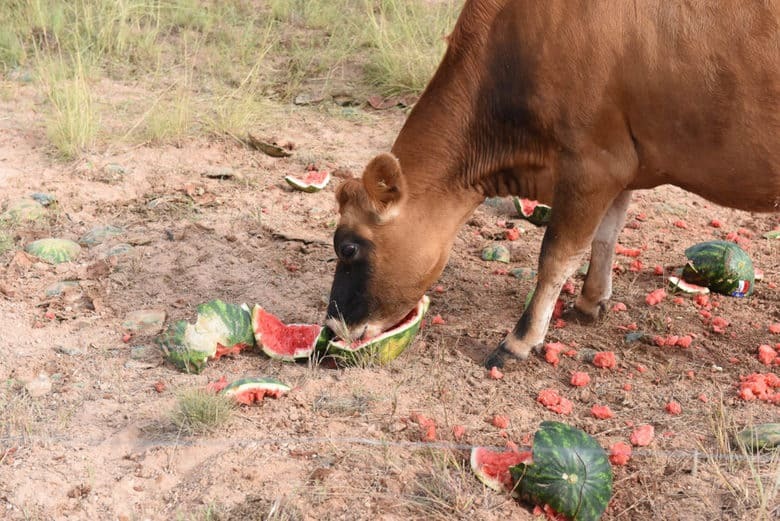 Yes, the cows love, love, love watermelon.